A good friend (PG) went on a safari in East Africa many years ago and brought back some photographs, one of which inspired this set of paintings I titled Waterbird. It’s a diptych (two paintings in a series), each 18 by 36 inches. Here they are separate, and then together. I found it a challenge to align the colors and compositions sufficiently, having to switch back and forth between two large paintings on an ongoing basis. My studio area isn’t big enough to put them side by side. I might need to try this once more. Near the very top of Mt. Baldy in California, at over 10,000 feet elevation, rugged trees battle hard winds and blistering sun every day. In the winter, it’s bitter cold and icy. 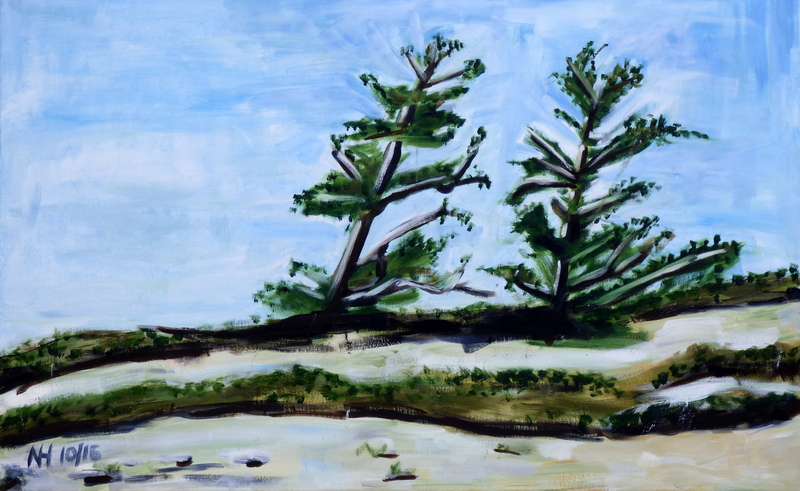 I took a photograph in the summer and made a painting, trying my hand at a loose brush. It turned out so-so, but I am done with it. 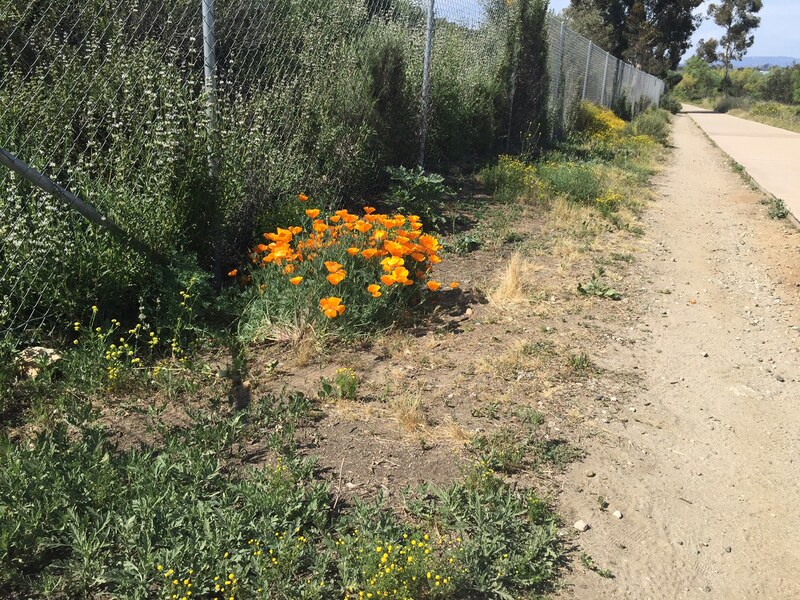 California Poppies are the state flower of California. They are protected. When I hike pretty much anywhere in California in the spring, they grow like weeds. Here is a little stand right next to I-15 to the left of the fence, a freeway with 6 lanes in each direction. 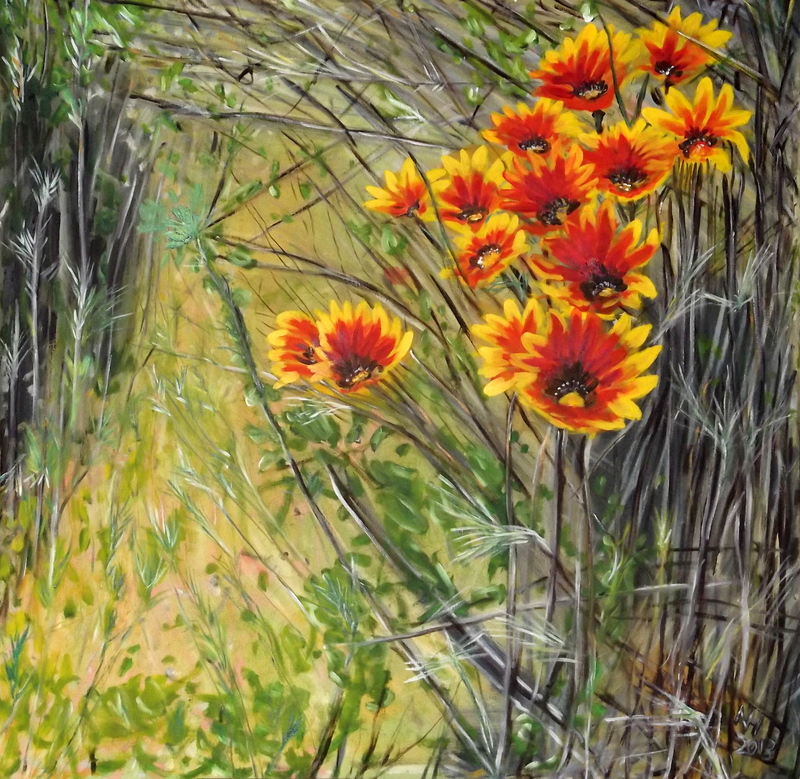 I did the painting above to be a diptych to go with the previous painting of daisies. Both these paintings are quite large, three by three feet each, so they’ll fill a large wall when they are next to each other. 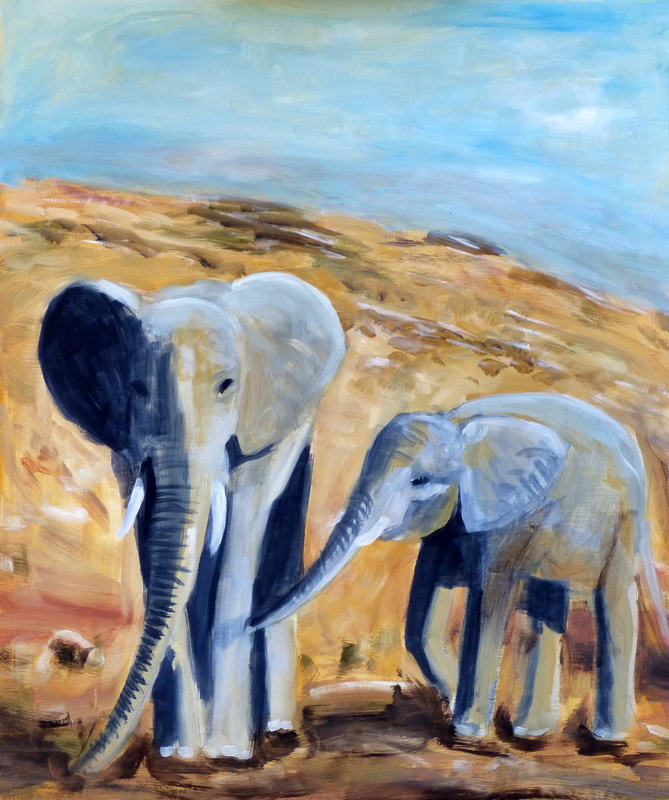 I painted a safari picture on a piece of plywood, based on a photograph Trisha brought back from Botswana last year. Then I mounted it in an old mirror frame with doors that was languishing around the house. This is the finished product in our entry way. Frame repurposed. Window to Africa established. Here is a larger version of the painting itself. 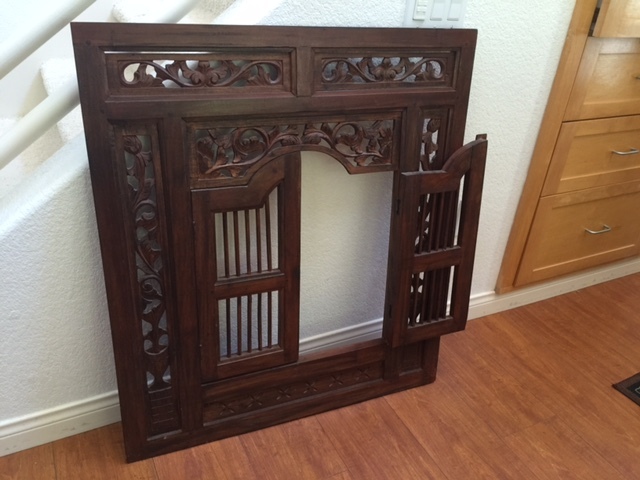 We have this ornate frame around the house which had an old mirror in it, and doors that flip open. I took the mirror out. Here is a picture of the empty frame. The opening is 24″ x 18″. 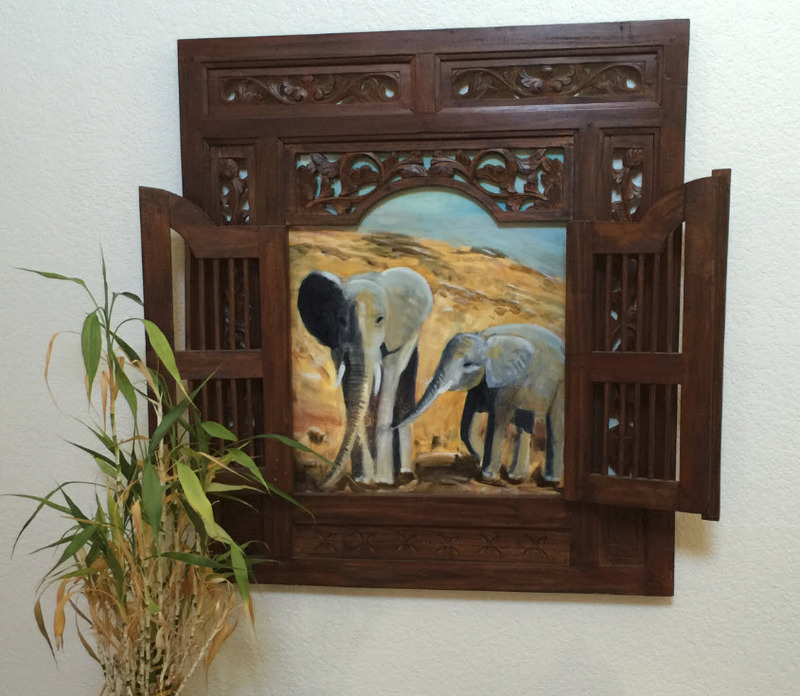 I bought a piece of plywood, cut it to the right size, and painted the elephant motif on it, so I can staple it behind the opening in this frame – after it’s varnished. It should be a fun conversation piece for the entryway at our house. I’ll post a picture when it’s done. In summer 2014, I went boating in New York with my friend Kevin and his family. At sunset, looking west from his dock, the neighbor’s boat sat on a boat lift, silhouetted by the bright setting sun behind the clouds. 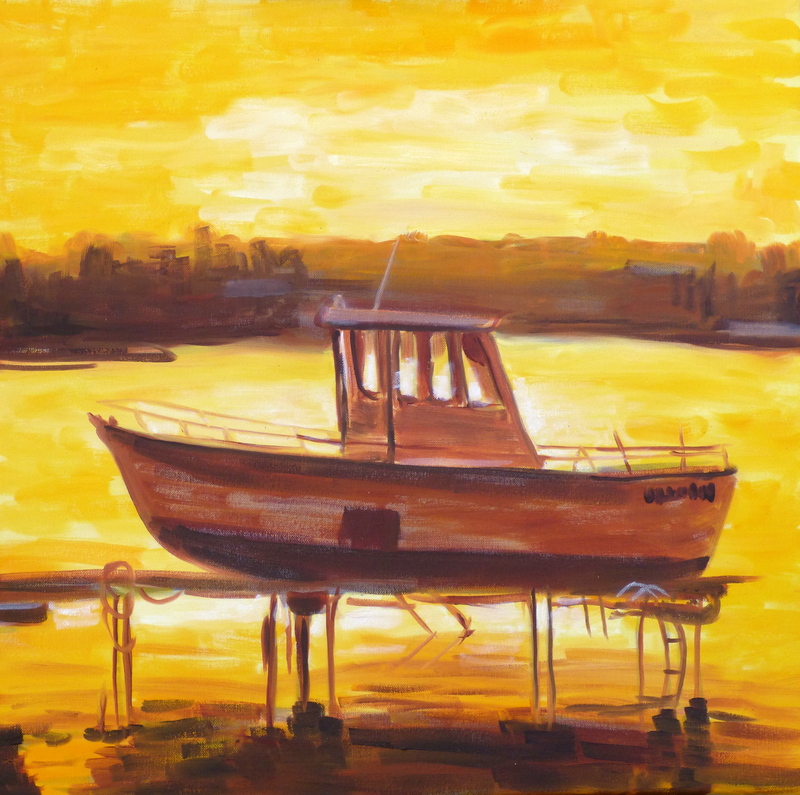 I used a simple sienna, brown and yellow palette, and applied only broad, wild brushstrokes. This is not my usual style. I wanted to see what I could do with a large brush, showing mood and color, and leaving the details to the imagination. While we were staying at Lucy and Tony’s house in Montana in September, I was fascinated with the old trucks resting behind their barn. Here is the resulting painting. 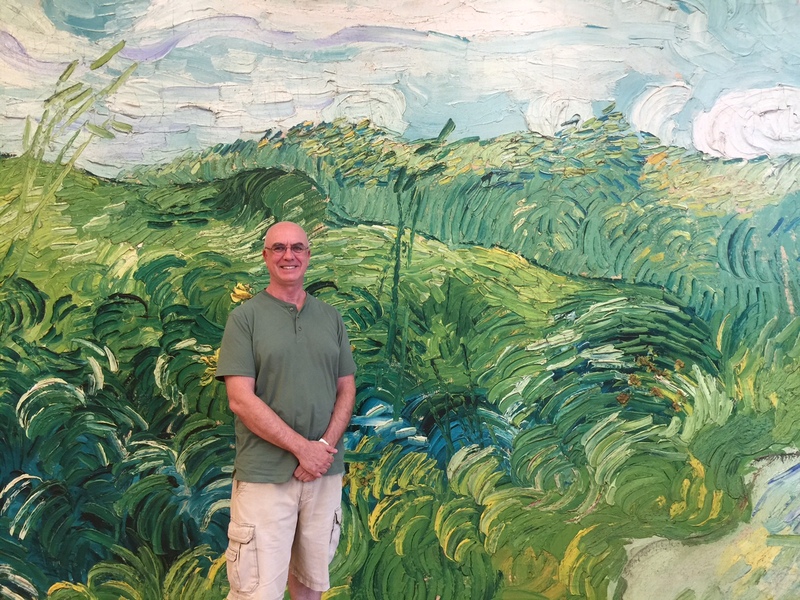 At the Philadelphia Museum of Art there are only a handful of van Gogh paintings. The most prominent one is one of his sunflowers. Mother Roulin and her Baby is another, less famous one. 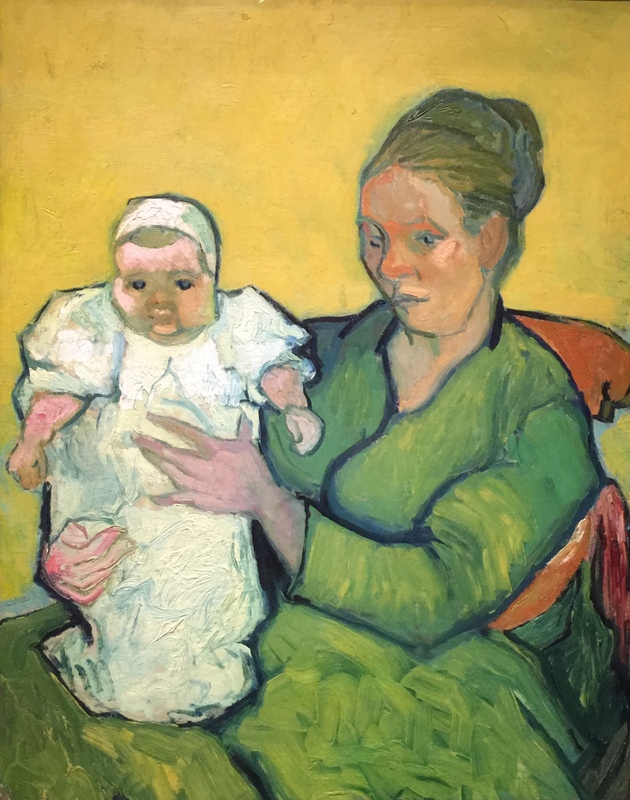 Van Gogh painted a lot of pictures of Mother Roulin, either by herself, or with her baby. There are also several paintings of just the baby, as well as a few charcoal or pencil sketches. I took this picture at the museum off the original with my iPhone. It brings out the colors well. The colors are truly van Gogh, and so are the brushstrokes and the free style. Circling the outlines of figures with cobalt blue is a common van Gogh technique. But really, look at the lack of finish work of the hands, the mother’s face and, most importantly, the face of the baby, which looks like a panda. If one of my paintings ended up like that, I’d wipe that face and start over again, and over again, until it looked like a baby’s face. Madame Roulin was probably not very happy with this and probably didn’t hang the painting up, unless Vincent was in the house. “Wow, your baby is ugly,” visitors would have said. But who am I? Just a guy who has done a hundred paintings in his life and painted over another 500 because they didn’t turn out, sort of like van Gogh’s Roulin painting. But he died and then became Vincent van Gogh. And that makes Mother Roulin and her Baby special, world famous and very valuable. Today I visited the Philadelphia Museum of Art. 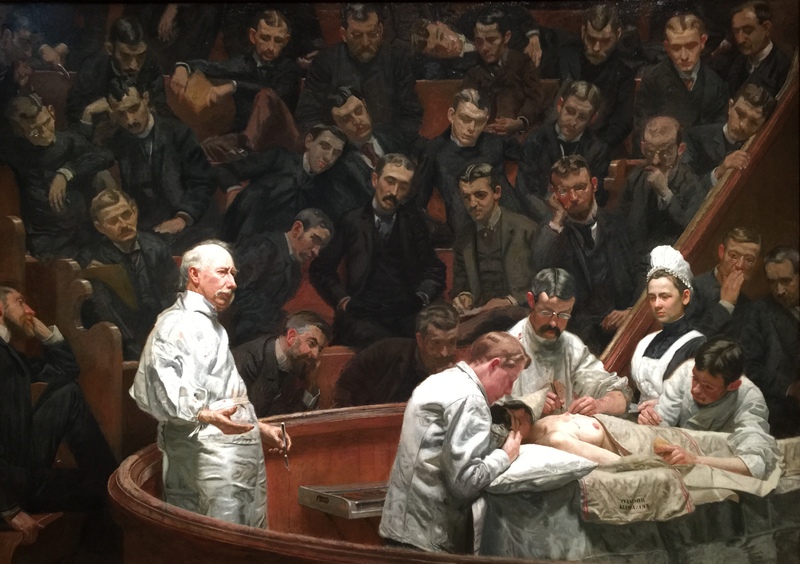 One of the most impressive paintings I saw was this huge painting (84″ x 118″), done by Thomas Eakins in 1889. This is one of the most important paintings in the history of medicine. It used to hang in the John Morgan building at the University of Pennsylvania School of Medicine. It is now at the Philadelphia Museum of Art. Today I saw more original Van Gogh paintings than in my entire life combined up to this point. It was a glorious day. The Clark Art Institute is one of a small number of institutions in the world that is both an art museum and an international center for higher education, research, and critical discussion of the visual arts. The Clark currently exhibits Van Gogh and Nature, featuring nearly fifty paintings and drawings from thirty museums and private collections around the world. The Clark is not easy to reach. It’s in the small town of Williamstown, Massachusetts, in the very north-western corner of the state, close to Vermont and New York. I came in on Route 2 from New York, a small country road over major mountains with 10% grades and prominent truck run-away ramps. When I left, for change of scenery, I decided to use Route 7, which was not much better, but I had great views of idyllic Vermont valleys, farms and homes. The Van Gogh exhibit is open from June 14 to September 13 only. There were many Van Gogh paintings that I had never seen before, annotated with explanations of the artist’s life at the time, where they were done, and the circumstances. There were also photographs of the actual locales, when available. 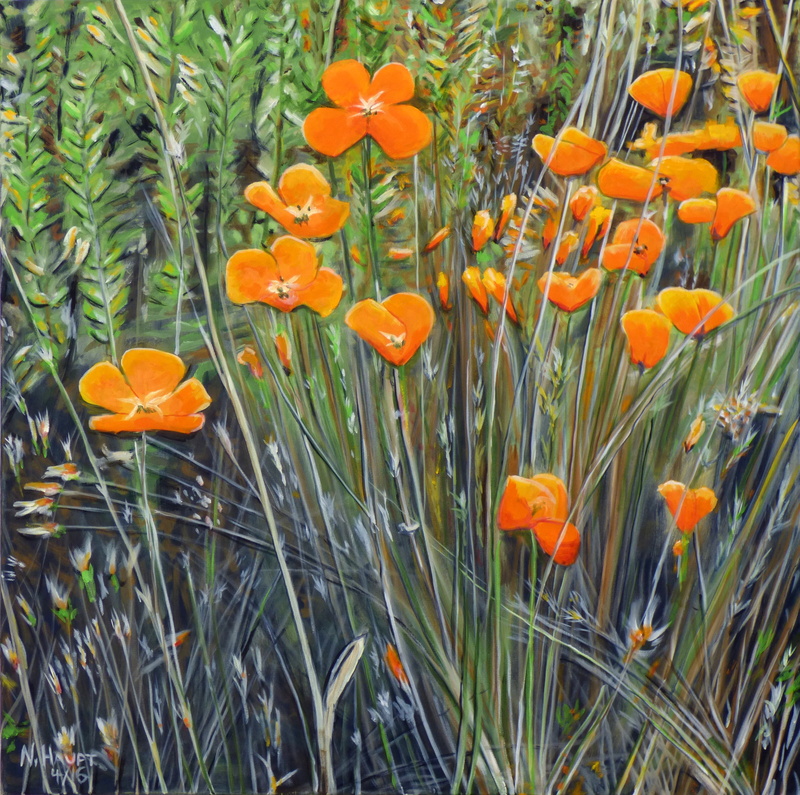 One of the paintings showed flowers in a copper vase. Then, four feet to my left, protected in a glass cube, was the actual vase. That took my breath away. As always when I see Van Gogh paintings, I am speechless and humbled about the fact that this artist never saw his own success, never sold a single painting, no matter how hard he tried. If only he knew that more than a hundred years after his death, thousands of people would drive over the hilly mountains of Western Massachusetts and pay $20 a piece to stand in line and spend a few minutes in front of each painting or even just his drawings and sketches; and millions of people all over the world view him as one of the premier artists of all time; and that his works sell for tens of millions of dollars each. If only he had had the opportunity to sell a painting or two, to earn some respect and success! That just might have prevented his death, and given us decades more of Van Gogh art that never came to be and forever remained locked in his soul. The artist Michaela Challal is my sister. 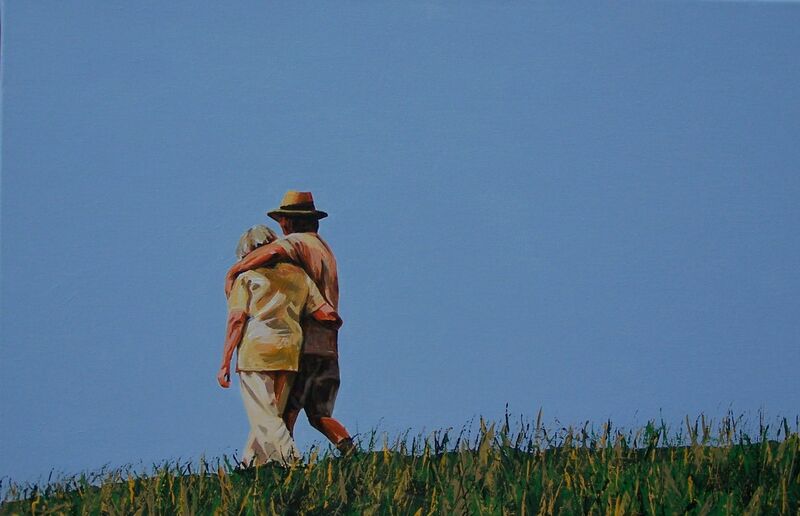 The painting is fashioned after a photograph of our parents out for a walk many years ago. Here is some more of her recent work. And here is a blog post from seven years ago showing a picture of the two of us as children. 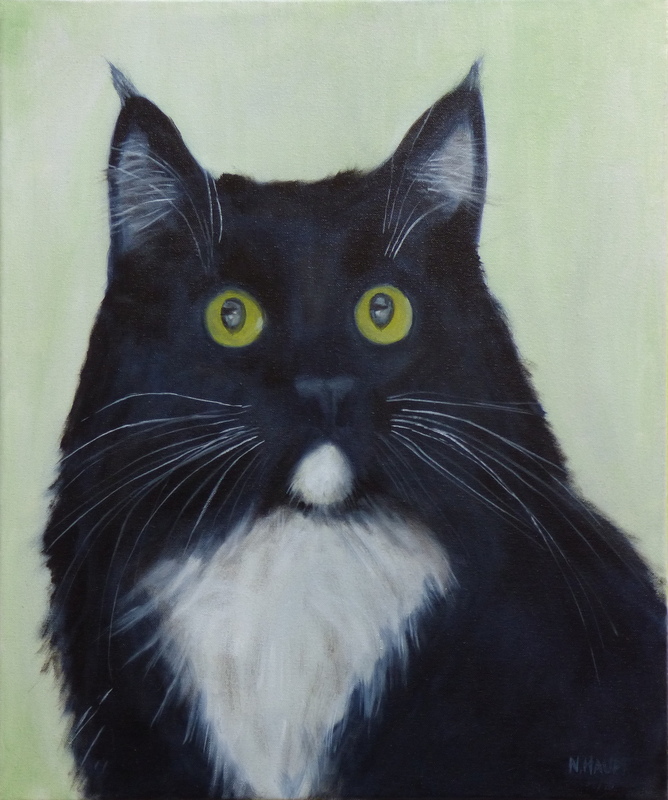 Friends asked me to paint a portrait of their late favorite cat, Bonnie. This was my painting project for Thanksgiving Day. Trisha and Mary Ann went to Africa on Safari. Between the two of them, they brought back over 4,000 photographs. 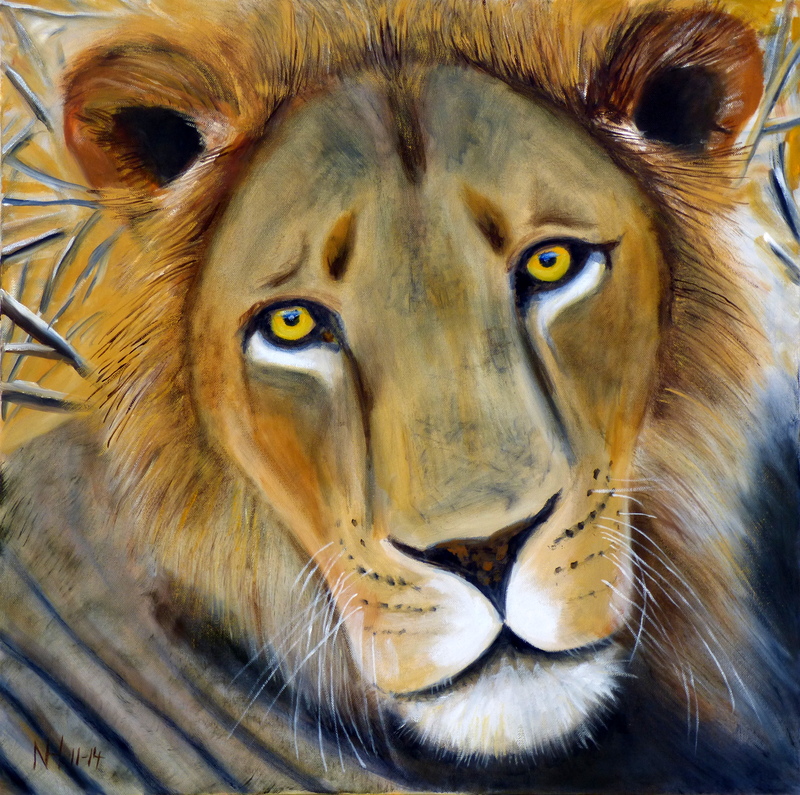 This is my favorite lion. Painted for Mary Ann. 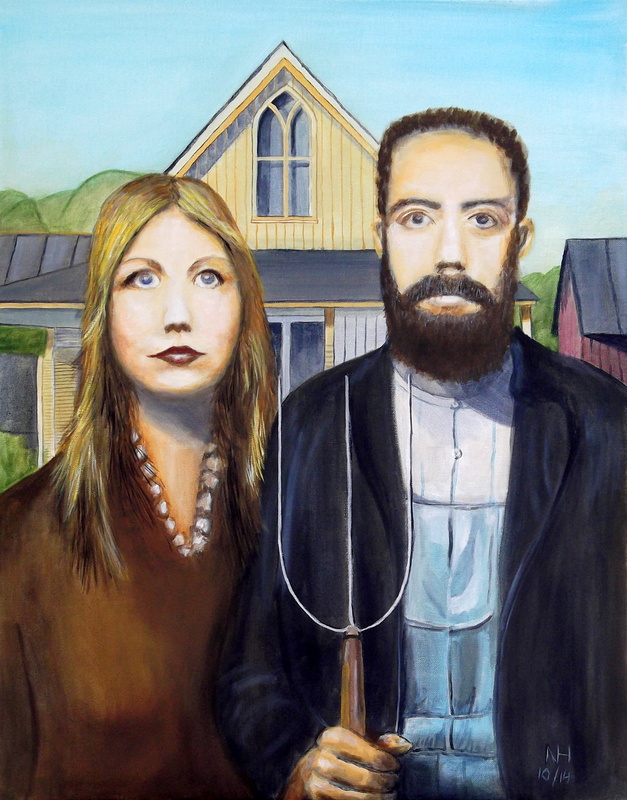 The 1930 painting by Grant Wood, titled American Gothic, is the most parodied painting of all time. If the artist only had known. Now it was my turn. This is my daughter with her boyfriend, their portraits lifted from her profile page on Facebook, and the background – well, follow this link.